The stylish Capone Brushed Steel Stool Green ties together contemporary and retro styling in a beautifully formed package. Revitalizing your interior with its vibrant and eye-catching style, the Capone is great for those looking to add a splash of colour to the bar area. 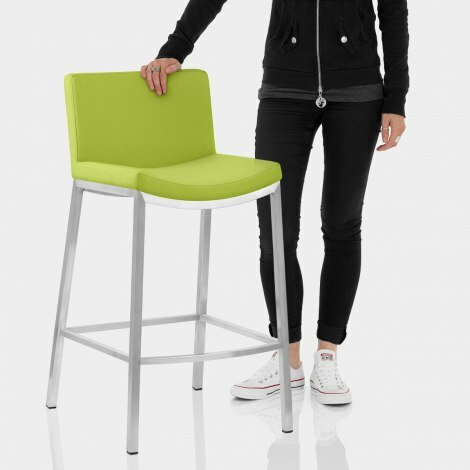 This refreshing stool features a stylish and copiously padded, comfortable seat. This is clad in striking green faux leather and showcases a high backrest and curved cushion for added support. With a steel frame in a sublime brushed finish, the stool is held at the perfect height for any bar table or counter by the sturdy four legs. These are capped by protective pads, which make it perfect for all types of flooring from carpet to tile, adding to the desirability and ensuring it works in any environment. "Very good quality and value for money"
We searched for a very long time to find the right stools for our kitchen island. We finally decided on these and it was like they were made for the space. The perfect height, vibrant colour, very comfortable and sturdy. They are also easy to assemble. I didn't have any problems ordering and they arrived on the day I expected. A very happy customer. Very pleased with product, easy assembly, colour just like photo. Exactly as shown in picture, very good quality and value for money. Arrived next day as promised, extremely easy to assemble would recommend this product and company to anyone. I ordered 2 of these chairs saturday morning & received them monday afternoon. Very good service, stools just what we wanted, colour exactly as seen in the picture.